New Updaters: We’re up to 25 states (halfway there!) with the addition of AZ and GA state license updaters. We also added support for CA nursing licenses, CO training licenses, KS behavioral health, and MA additional titles. Upcoming: Keep an eye out in the next few weeks – we’ll be rolling out support for Nursing licenses in AZ, MD, MI, and SC (you can already use these updaters for MD/DO and most other licenses). We’re not quite ready to roll out the NC updater for DMD and DDS licenses, so for now, use the primary source link to find your providers’ licenses – we’ve updated it to reflect the NC dental board’s verification page. When you’re editing facility-specific payor data, check out the new Provider Number field. 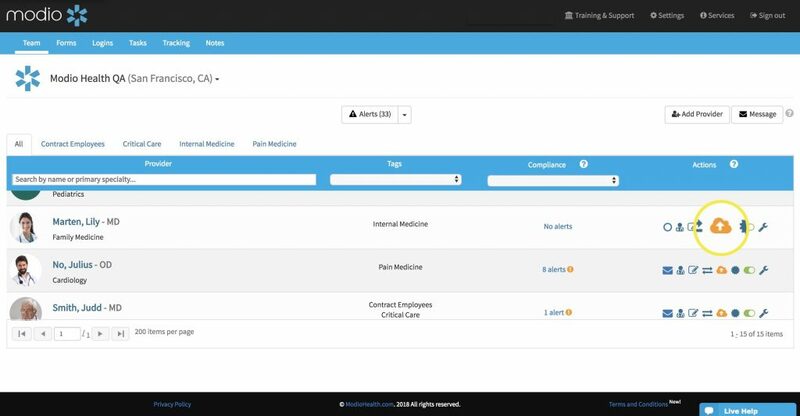 If you don’t remember how to get here – from Payors, add a facility in the Practice/Employer/Facility Affiliations column, then click on the facility name to open a pop-up window with facility-specific credentialing info. Flag Action: We’ve added a new flag icon to the Actions column to help you mark urgent items. When you click the flag, it’ll change your report priority to Escalation and display the report in bold for easier viewing. Summary Card: Look for a few helpful updates to the Tracking summary cards (hover over the report names to open) – you’ll see the Tracking ID number next to the name, “Original Due Date” to replace the field “Est. Due Date”, and new field “Projected Due Date”. There’s also color-coding for the new day counter at the top right: red for overdue, green for ahead of schedule, and grey for on time.